Play Imperial Fruits: 5 lines Slot Online with 500 Free Spins! Imperial Fruits: 5 Lines is a 5 reels, 5 paylines online slot game by Playson. Imperial Fruits: 5 Lines has Wild, Expanding Wild and Scatter symbol features and an RTP of 96.71%. We’re happy to offer Imperial Fruits: 5 Lines as part of our range of more than 500 great UK online slots here at Rose Slots, which includes Fluffy Favourites, Starburst, Rainbow Riches and Great Rhino. In an online slots market that increasingly seems to be focused on one developer trying to one-up another with extra bonus features or cinematic graphics, or a crazy theme which nobody has ever attempted to use for online slot games before, it’s refreshing to see a developer catering to the traditional market. Playson have released several slots game which offer solid and familiar classic-themed gaming, and Imperial Fruits: 5 Lines is the latest of them, having been released to the UK market in March 2019. From the day that Playson opened in Malta in 2012, they hit the ground running, and have been sprinting ever since. It took them only three years to secure a much-prized license to operate in the UK, giving them access to the lucrative UK online slots market of the kind that every developer needs if they're going to be considered a big deal. In less than a decade of operations, they've expanded to the point where they have several hundred employees and multiple offices all around the world. Wherever there's a gaming market, you'll find a Playson office. We mentioned earlier on that they have a particular focus on the traditional market, and that's much evidenced in their back catalog, which contains classically-focused slots like Joker Expand, Fruits and Jokers and Burning Wins. Don't make the mistake of thinking that's all they're capable of though; in Legend of Cleopatra, they've created one of the most boundary-pushing and complex online slots we've ever seen. Playson can work on the large and small scale, and if the next ten years is anything like their first, they may one day dominate the entire industry. If you have enjoyed playing fruit themed slot game you may probably like to play 100 Joker Staxx slot game and Fruits & Jokers slot from the same developer as well. As is heavily suggested by the name, Imperial Fruits: 5 Lines (which we'll shorten to ‘Imperial Fruits' for the remainder of this review) has only five paylines to look out for, in a layout comprising five reels and three rows. It's as traditional as traditional could be. Five paylines doesn't sound like a lot to chase after, which may make you wonder how an RTP of 96.71% is achievable, but the answer lies in a reduced number of symbols. 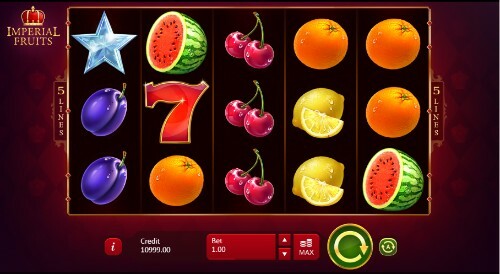 If you were playing a physical fruit machine you wouldn't expect to see more than seven or eight standard symbols at the most; as this slot does an excellent impression of a fruit machine, eight symbols in the base game is all you get. We're talking about fruit machines because, as you also may have guessed from the title, the symbols we speak of are all taken directly from that old-fashioned fruit machine world. This is a no-frills presentation. Everything is very well drawn and animated, but there's nothing flashy about it whatsoever. The reels are set into a plain red background with an ornate frame, and that's all there is to the design. If you're looking for the latest video slot innovations, then look elsewhere. As we said above, at Rose Slots there are more than five hundred online slot games for you to choose from, and you'll find plenty that will be right up your street! If you're one of the traditional crowd, though, you'll find this new offering to be well worth your attention. The specific fruits which have found their way onto the reels are oranges, lemons, cherries, pears, watermelons, grapes, plums and a Lucky 7. The only slight break Imperial Fruits makes from tradition here is that it doesn't include either a bell or a Bar symbol, but we can let it off the hook for that because it has three special symbols to offer instead. This isn't the right place to talk about them, though. They belong in the bonus features section, so let's get to it! Strictly speaking, there are no bonus features in Imperial Fruits. No prize pickers, no multipliers, and no free spins features. Not even a humble gamble feature! Playson have resisted the temptation to muddy the waters of creating a traditionally-themed slot by adding in features that don't belong there, and we applaud them for that. We know that some of our Rose Slots players stick firmly to the classical style, and so this is a great slot for them. There is one tiny piece of flair in the slot, however. If you've read this far, you might be wondering what makes the fruit ‘imperial.' The answer to that question is a crown symbol, which serves not only as a wild but as an Expanding Wild. It can substitute for any symbol other than the two scatters (more on them in a moment), and it will also expand to fill whichever reel it appears on if there’s a winning line to be created by doing so. Granted, this wouldn’t happen on a physical slot machine, but this is an online slot so we can give it some leeway. As well as the wild, there’s also a Gold Star Scatter and a Diamond Star Scatter. They don't trigger any bonus features or side games, but they can boost your winnings when they show up. The gold star is free to appear on any of your reels, and if all five of them turn up at once, you'll get an instant cash payout of 100x your line bet. Despite diamond being more valuable than gold, the diamond star scatter is actually worth less. It can only show up on the first, third and fifth reel, and will reward you with 20x your line bet when it does so. This is a very solid take on the classic format, with just a tiny hint of the modern era to give it a bit of flavor. It won’t win any headlines or awards, but it’s a fine slot for those who prefer their playing experience to be a little more quiet and relaxed than the latest character-driven blockbuster.